I’ve always wondered how to use eyelid glue. I knew it was a prime tool in the make-up kits of Japanese gyaru seeking that perfect babydoll look, but never understood just how it worked. Then I discovered this handy guide in Kera magazine! 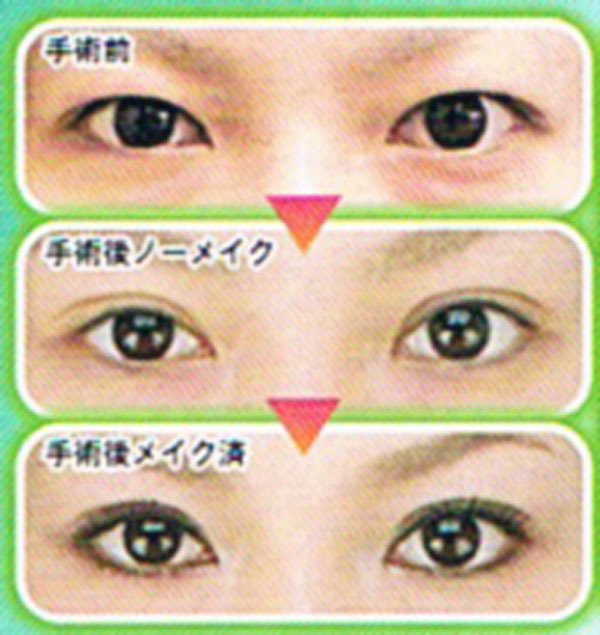 At the top is how Japanese eyes look naturally. In the middle, after gluing. Bottom: glued, with make-up. 1: Clean off all your make-up before putting on the tape. Use the end of the “pusher” stick to push the fold above your eyes deeper, to check for position of fold and length of tape. 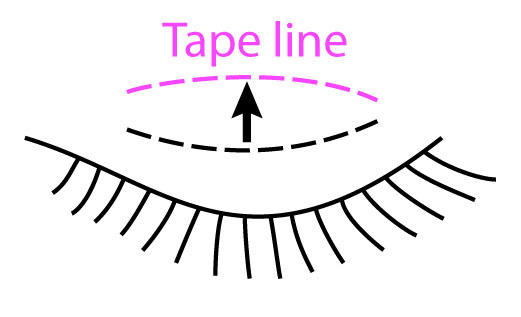 At the midpoint of your eyelid, the line of tape should be about 10mm above your eyelashes. 2: Pinch the pins at both ends of the “medical fiber” tape between your fingers and slowly stretch it until it’s about 8 cm long. 3: Position the stretched fiber (tape) along the line where you want the fold to be and pull it firmly against your eyelid until it sticks. 4: Before using the “pusher” stick to make the fold, trim off the extra tape. The line of tape should be around 30mm long. 5: Use the stick to push the skin under the line of tape deep into a fold beneath the tape. Hold it with the stick so the line of sticky tape adheres to the skin closer to where your eyelashes start. Wait for it to set securely. Eyelid tape and glue wash off with water, and while they all claim to keep your eyes looking innocent and appealing for a day, most of the reviews I’ve read complained that eyelids had to be redone after a few hours. Mileage varied when users compared the new “medical fiber” type of adhesive used in the above directions to the older, thicker tape, but everybody agreed that the tape was more reliable and attractive than the kind you have to paint on, which makes for un-cuteness if it fails and your eyelid is suddenly marred by a swath of unnaturally white dried glue. Ahhhh!!! I’ve always found putting stuff in one’s eye to give me the gibblies! Well, this stuff doesn’t actually go IN your eye, but I know what you mean! It looks creepy while you’re doing it for sure! I’m not quite sure what you’re asking, but if you’re looking for eyelid tape, you can buy it at any drugstore or Don Kihote in Japan. I’ve never seen it outside the country, though.